When Joshua Steckel left his job as a private school college counselor on New York City’s Upper East Side to work at a public high school in Brooklyn, he discovered that for low-income students the competitive game of college admissions has entirely different rules and much higher stakes. 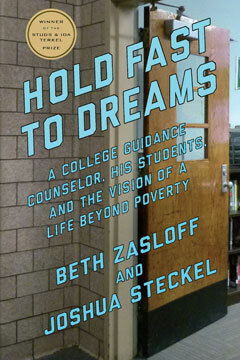 The winner of the Studs and Ida Terkel Prize, Hold Fast to Dreams—which Kirkus called “a powerful story of courage and hope that should inspire others to follow trailblazers like Steckel and his students”—traces the pathways of ten of Josh’s students from their obstacle-ridden application processes through their life-changing college experiences. Including the stories of young people who apply to college from homeless shelters, as undocumented immigrants, and while facing turbulent homes, pregnancies, and health crises, Hold Fast to Dreams offers what Booklist calls “a profound examination of . . . the kinds of reforms needed to make higher education and the upward mobility it promises more accessible.“ It provides hope in its portrayal of the extraordinary intelligence, resilience, and everyday heroics of the young people whose futures are too often lamented or ignored and whose voices, insights, and vision our colleges—and our country—desperately need. The views expressed in the book are the authors’ alone and not necessarily those of the New York City Department of Education. National K-12 Education reporter Motoko Rich includes Hold Fast to Dreams in a round up of "What We're Reading" at the Times. Read a Q&A with Josh Steckel and Sponsoring Young People in Spark Action.